1940 At the time my father 'messed' with several close acquaintances at the home of a friend called Willie Carboni. One day an attempted landing elsewhere by the Allies brought reprisals to the Rock in the shape of a raid by over one hundred French planes. It caught Pepe (1.1) and others at Willie's house. Unfortunately Carboni had long been handicapped by polio and required the help of a pair of walking sticks to get around. Pepe (1.1) and his friends gallantly refused to rush out for shelter and leave him. Walking slowly at Willie's pace they never made the shelter on time. Huddled in a doorway they had a grand stand view of the French reprisal. It was by all accounts a grisly experience. 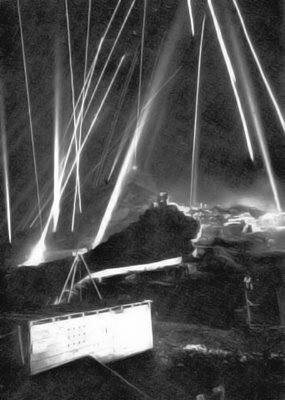 Searchlights criss-cross the skies of Gibraltar during an air raid. The house of another family acquaintance called Pepe Cassaglia was sometimes also used as a 'civilian mess' during the war. My father seems to have been an occasional visitor. Cassaglia was quite well off and was the kind of man who would take over a brothel for the night so that he and his friends could indulge their revelry without interruption. Among the guests in his 'mess' - and no doubt at some of his brothel parties - were two Englishmen who would periodically disappear for weeks on end. It was obvious that they went into Spain but no-one knew exactly what they did there. It was more than likely that they worked for one of the Intelligence Departments. M.I.5, for example, had quite a few of their agents in Gibraltar at the time. The Rock, of course, was the goal of many shot-down or escaped allied airmen. They crossed into Spain via the Pyrenees guided by Andorran smugglers who knew a thing or two about their business. On the 12th of November Hitler issued his Directive number 18 which was code-named Felix. In it he envisaged that Gibraltar should be taken with or without Spanish help. Included were general instructions as to the roles of the Army, the Luftwaffe and the Navy during the assault. Felix was to be followed by another operation called Achse, involving a drive towards Suez. 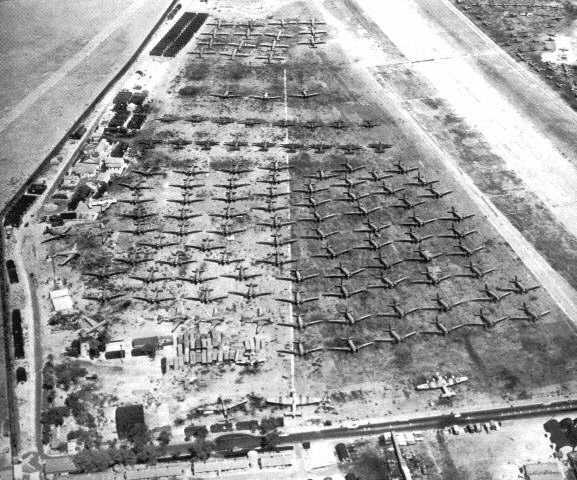 Operation Felix by itself would have required some 65 000 troops under the command of a Field Marshal. 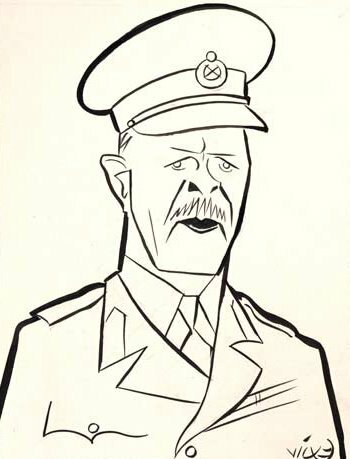 Undoubtedly with the fall of France, Gibraltar became of crucial importance to German strategy, and a number of German bigwigs including Admiral Raedar, urged Hitler to sanction the project, which incidentally was being planned at the same time as Operation Sealion, the proposed invasion of Great Britain. Count Ciano, the Italian foreign minister at the time recorded in his diary a meeting between Hitler and his father-in-law Mussolini. He wrote : 'Hitler declared . . if we encompass the fall of Gibraltar, we shall bolt the door of the Mediterranean . . . I continue to give number one priority in the Med. to the expulsion of the British fleet'. Neither plan, however, was ever followed up. Whether British Intelligence was aware of operation Felix or not is a moot point. The German military cipher, the so called 'Enigma code', had probably already been cracked. Whether they knew or not, they undoubtedly expected an attack at any time. Hence the speed with which underground works such as the workshops and the hospital were constructed on the Rock. Hence also the haste with which the civilian evacuees from Morocco had been bundled out again. Winston Churchill had long been aware that the harbour at Gibraltar would become unusable if the Spanish government yielded to German pressure and became Hitler's ally or co-belligerent. He had therefore set up his own Operation Shrapnel as insurance. Shrapnel entailed the seizure of several Atlantic islands to secure the necessary air and refuelling bases needed to maintain naval control of this critical stretch of water. 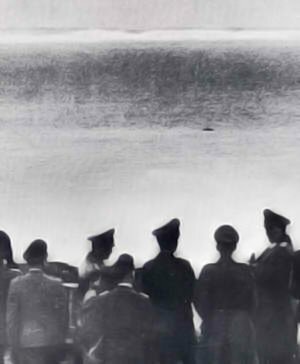 According to Göering, Hitler's failure to march through Spain, with or without Franco's assent, and to capture Gibraltar, was his most damaging mistake of the war. Though the issue was never put to the test, it is more than likely that Operation Felix would have succeeded. In his final analysis of the War, written in the Berlin bunker, Hitler seemed to have been convinced that with his commandoes and Franco's connivance, he could easily have captured the Rock. Villa Vieja was once again in the firing line and that of course, included Crutchett's Ramp. The old house seems to have escaped by the skin of its teeth. On a lighter note it seems that at the time a group of friends were having dinner together at home. One of them with some electrical know-how had connected a microphone to the Radio and placed this in another room. As they dined listening to the BBC the practical joker excused himself. A few minutes later the music faded and out came a voice with an impeccable BBC accent. The reaction was a deep silence. Then the inevitable, '¡Coño!'. Those in uniform suggested that they should return immediately to their posts. The next moment the radio blared out a particularly absurd song of the time in the broadest of Yanito accents. 'La bata porque si, que si, que si . . . La bata porque no, que no, que no . . .' No record exists of what happened to the electrician. 1941 Another military man, General, the Viscount Gort of Victoria Cross fame, had distinguished himself a short while back during the retreat from Dunkirk. According to Churchill his plan to march to the sea, 'executed with masterly skill’, would ever be regarded as a brilliant episode in British military annals. For his pains he was now installed as Governor of Gibraltar. There were one or two problems that required his attention. 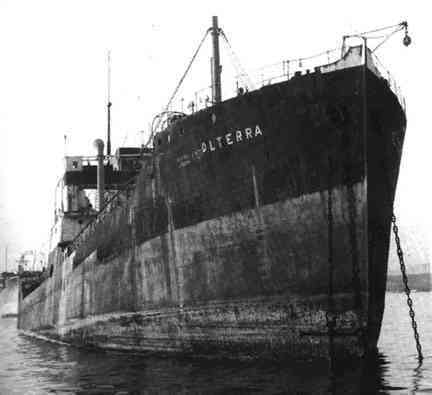 For a start Italian frogmen had installed a secret base in the holds of the merchant ship Olterra which was anchored in Algeciras. Using mini-submarines, these ingenious frogmen had managed to sink several British, U.S. and Norwegian ships in the port of Gibraltar. They were proving difficult to stop. In fact over the course of the war they sank or seriously damaged some 84000 tons of shipping. 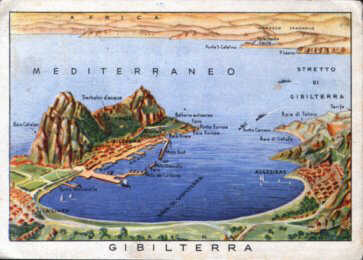 Postcard of Gibraltar issued for the Italian troops. The New Year had also brought its problems to Madeira. British blockade measures ensured that no mail could be sent from the island to any country other than the U.K. or Portugal. The Portuguese were understandably annoyed and retaliated by holding up the mail to and from Madeira and Gibraltar. The problem was eventually resolved in May. In Gibraltar 'Operation Monkey' was being set up. 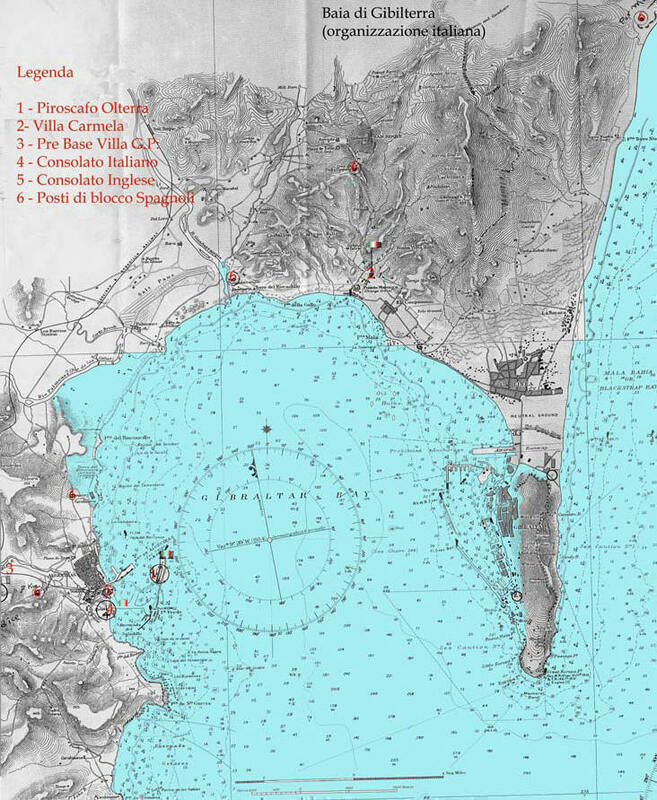 This was a contingency plan in the event of the capture of Gibraltar by the enemy. It involved the entombment of two naval officers inside a secret cavern high up on the cliff face with peep holes to spy on enemy shipping in the Straits and a radio to report back to London. The need never arose, but it was planned to the last detail, including the psychological conditioning of the two officers who volunteered for the job. The man responsible for setting up this bizarre operation was a naval survival expert, Surgeon-Commander Lewick. He had been Medical Officer in Scott's Antarctic expedition and had been brought out of retirement at the age of 64. It was said that Ian Fleming of 'James Bond' fame, had also had a finger in the pie. 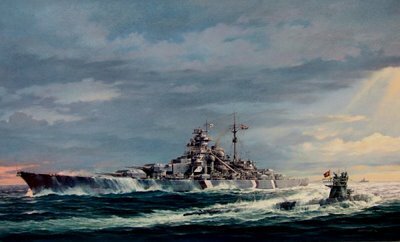 On the 24th of May the German battleship Bismarck sank the Hood off Iceland. Sailors aboard the accompanying British ships watched in horror as one of the most beautiful warships ever built, and a well known sight in Gibraltar harbour, sank in three minutes after several direct hits and an enormous explosion. It was a major disaster as the Hood had been considered by many as the most powerful ship in the British Navy. That same day Force H set sail from Gibraltar to join the other squadrons in their search for the Bismarck. On the 27th of May the British Navy gained their revenge. 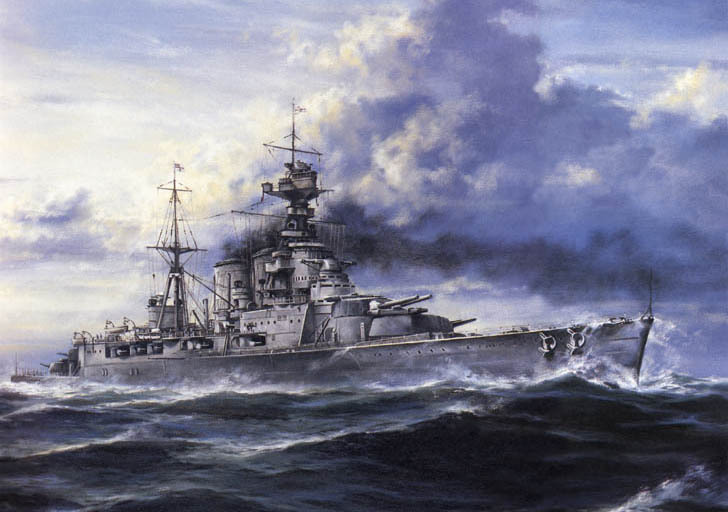 In one of the greatest sea battles of the war, they finally destroyed the Bismarck. In June Germany invaded Russia. But there was also some good news. In July the Gibraltar Chronicle was pleased to summarize the activities of Lady Liddell's Guild. They had been at it again in Madeira. The report showed that they had given some 200 ounces of wool, a few dress lengths and garments and the breathtaking sum of 70 escudos in grants to the deserving poor among the Gibraltar evacuees. That same month the last ship carrying evacuees left for the U.K. The evacuation was complete. Airplanes and gliders in Gibraltar. They would take part in Operation Gymnast. In August a Curfew Order forbade anyone being out of doors on the Rock from 11.30 pm to 5.30 am without a written permit. Soon after, work began on the plans for Operation Gymnast which involved the invasion of French North Africa. In Tangier, a bomb went off when mailbags were being unloaded from the Rescue, a former salvage vessel that was being used as a ferry between Gibraltar and Morocco. The bomb killed several Gibraltar security policemen and Arab stevedores. Another policeman was badly injured. He was a brother of Tommy Flower, a relation through the Letts family. The reason for the bomb was never made very clear, but it was thought to be the work of German agents in retaliation for the blowing up by Allied agents of an elaborate Abwehr observation post overlooking the Straits.